I’ve spoken live hundreds of times at conferences, universities, and corporations, to small groups as well as at TEDx and to audiences numbering in the thousands. I’ve also been interviewed on radio, TV, as an expert source for articles, and on more than 50 podcasts. Josh Steimle is an author, speaker, entrepreneur, and executive coach. He has written over 300 articles for publications like Fortune, Time, Forbes, Inc., Mashable, TechCrunch, and Entrepreneur, and is the author of Chief Marketing Officers at Work, which contains 29 interviews with CMOs from organizations like GE, the Harvard Business School, Spotify, Target, and PayPal and was recognized in Success Magazine as one of the 5 Best Business Books of 2016. Josh is a TEDx speaker, has presented to audiences in Asia, Europe, the Middle East, Latin America, and North America, and has been interviewed on local, national, and international radio and TV programs and on more than 50 podcasts on topics related to technology, marketing, personal influence, and entrepreneurship. Josh is the founder of MWI, a digital marketing agency with offices in Hong Kong, Singapore, China, the UK, and the US. He is also the founder and CEO of Influencer Inc, a publishing, training, and events company that provides personal branding and thought leadership services to CEOs and other executives. Entrepreneur Magazine put Josh on their 50 Inspirational Entrepreneurs to Watch in 2017 list, Forbes recognized him as one of 25 Marketing Influencers To Watch In 2017, Josh was ranked #7 on Richtopia’s list of Top 100 Most Influential CMOs, and data from social media research firm Leadtail ranked Josh #11 on their list of People Most Mentioned and Retweeted by CMOs. Josh consults with leaders in government on topics related to entrepreneurship and startups and has held various board positions and otherwise worked with non-profit entities related to adoption, education, entrepreneurship, economics, and government policy. Josh holds a Masters of Information Systems Management from Brigham Young University (BYU). Josh started his marketing agency while a student at BYU where he won the BYU Business Plan Competition in 2001. Josh was named the Young Entrepreneur of the Year in 2002 by the Utah chapter of the Small Business Administration. Josh lives on a farm near Boston with his wife, two children, and 27 horses, and is an avid reader, trail runner, triathlete, and skateboarder. He is an active member of The Church of Jesus Christ of Latter-day Saints (aka “Mormons”) and served a mission for his church to Manaus, Brazil. He is fluent in English and Portuguese, can get by in Spanish, and continues his quest to learn Mandarin after living in Shenzhen, China for two years. The Innovative Agency Podcast: February 13, 2019 - 4 Steps for Agencies to Generate Massive Revenue With Thought Leadership. One of the most profitable revenue streams remains untapped at most agencies: thought leadership. The phrase may sound akin to an over-utilized buzzword, but Josh Steimle, agency owner at MWi would disagree. Using his publications in Forbes, Entrepreneur, Fast Company, and industry publications, he’s generated $5M in revenue. And no, it wasn’t difficult to get in. He simply joined contributor programs at each, published his articles without pay, and went from near-bankruptcy to a flourishing agency in a matter of months. 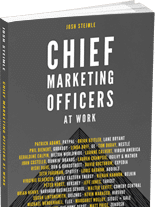 The CMO Show Podcast: March 16, 2017 - What does it take to be a successful CMO today?